CLIMATE-change-related development restrictions would have impacted on a property owned by the parents of a state MP who successfully cam­­paigned to block the measures. LNP Member for Pumicestone Lisa France lobbied Planning Minister Jeff Seeney before he ordered Moreton Bay Regional Council to remove references to a theoretical 0.8m sea-level rise by 2100 from its draft planning scheme. OPINION: Will climate denial sink the LNP? Mr Seeney’s move following a backlash from homeowners who feared that their property values would plummet. Ms France earlier claimed that none of her immediate or extended family owned any property that would have been affected under the controversial proposal to limit building or redevelopment of properties deemed at medium to high risk of flooding. But planning documents seen by The Sunday Mail reveal that a 1000sq m vacant lot owned by Ms France’s father, Barry France, at Bongaree on Bribie Island – part of the Moreton Bay Regional Council area – would have been included as a “medium flood hazard area” under the draft plan. That would mean it could face planning restrictions or conditions, depending on what kind of development application was lodged. Ms France said neither she nor her parents knew their land would have been impacted. “They also have no plans to do anything on that vacant block of land … it’s been sitting vacant for years,” she said. Ms France said the proposed plans had been removed from the council’s website after the public consultation period ended in August, which meant she was unable to check the maps. Mr Seeney’s order did not apply to Moreton Bay’s neighbouring councils, Brisbane and Sunshine Coast, which have incorporated the same 0.8m sea-level rise into their planning schemes, although not with the same hardline approach to development restrictions. With a rift developing in LNP ranks as some MPs fear the party being portrayed as climate change deniers in the lead-up to next year’s state election, an urgent compromise is being sought. A spokeswoman for Mr Seeney said meetings would be held early next week between council and State Government planning officers to work on ways to include the sea-level rise in the planning scheme without impacting on individual’s property rights. She said while there had been talks, there was a renewed focus to find a resolution. Moreton Bay councillors, who have received legal advice that the council could face legal liability if it did not include the potential sea-level risk in its plan, unanimously passed a motion of “no confidence” in Ms France and condemned her for spreading “incorrect or misleading information’’. Moreton Bay mayor Allan Sutherland’s House at Scarborough. MORETON Bay Mayor Allan Sutherland’s multimillion dollar home has been classified “risk-free” from flooding while his neighbours have been deemed flood-prone – and the State Government wants to know why. 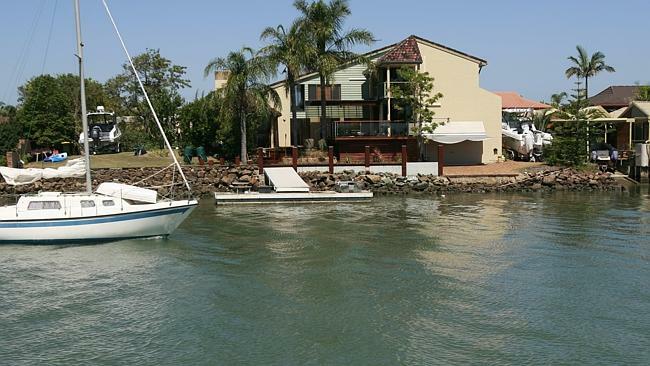 Cr Sutherland’s neighbours at Newport on the Redcliffe Peninsula have been included in the “medium to high flood risk zone” however the mayor’s $2.1 million canalfront home has been spared. Cr Sutherland said he had no involvement in his property being deemed risk-free from a projected 0.8m rise in sea levels by 2100 and said it had exposed him to “sarcastic’’ and “hurtful’’ comments from locals. He said his house, over two lots, was higher than neighbouring houses because it was built on fill 30 years ago. The elevation, which he estimated to be about 1.8m to 2m, was especially noticeable if viewed from the water, he said. “It is considerably higher than the houses each side,’’ he said. exclusion of Cr Sutherland’s property was a puzzle. potential flooding than other lots in the same street,’’ the spokesman said. Cr Sutherland said risk maps were prepared by an external contractor and other houses in the immediate vicinity had also been categorised low risk. He said there were hundreds, if not thousands, of such properties across the region. “Certainly in no way did I, and have I, ever directed anything on my land and I’d take inference if anybody ever suggested that. Councillors don’t get involved in that level of detail” he said. The development is the latest skirmish in an ongoing stoush between Cr Sutherland and the Newman Government over properties zoned at possible risk from rising sea levels. 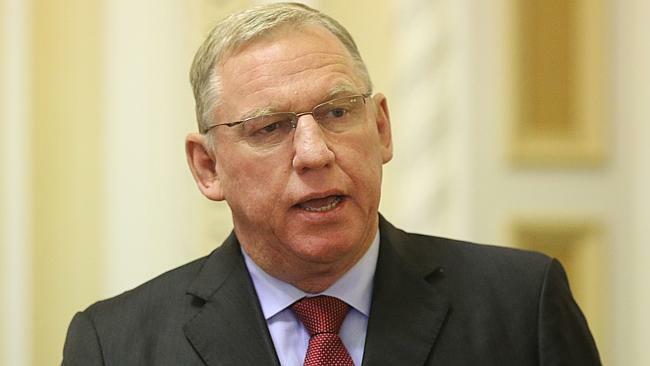 Deputy Premier Jeff Seeney ordered Moreton Bay Regional Council to remove references to climate change-related flood hazards from its draft planning scheme after a backlash from homeowners who feared their property values would be slashed by a ban on future building and development. His home was at the centre of a controversy in 2010 when it was revealed that the mayor bought it from a local developer, who was also his biggest political donor, in a three-cornered deal that also saw Cr Sutherland sell two properties to the developer. Mr Sutherland referred that matter to the Crime and Misconduct Commission, which found no wrongdoing. Mayor Allan Sutherland, whose council was forced to remove any assumption about a "theoretical projected sea level rise" from its plan. The Queensland Government will force more councils to remove climate change references from their regional plans, the Moreton Bay Mayor has warned. 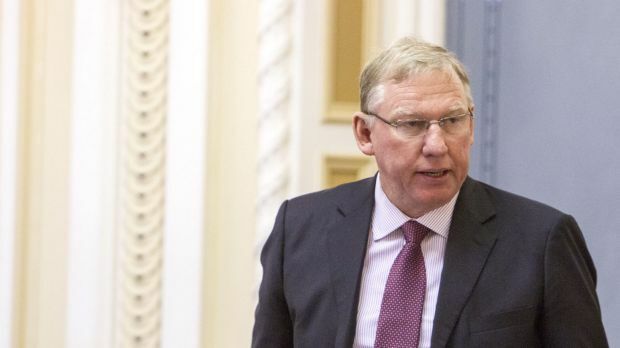 Deputy Premier Jeff Seeney ordered Moreton Bay Regional Council to remove any assumption about a "theoretical projected sea level rise" from its plan. Mr Seeney said the reference to climate change would have restricted the right of residents to build and develop their properties. 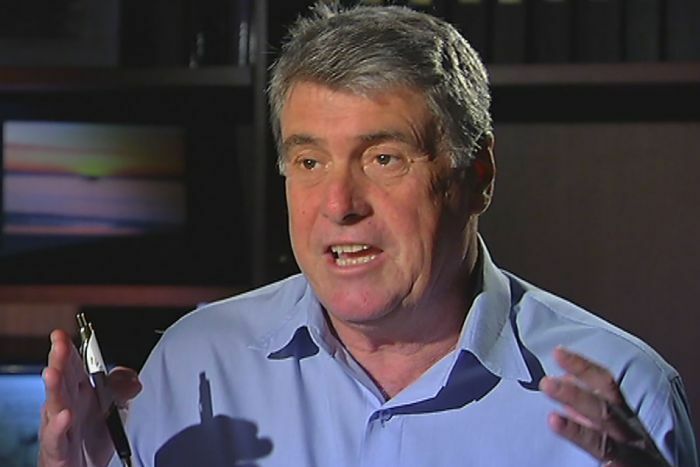 Mayor Allan Sutherland said the edict meant his council would be out of step with Brisbane, Sunshine Coast and other councils that had incorporated the same assumption of a 0.8 metre sea level rise by 2100 into their plans. "The Deputy Premier, I believe, will have to instruct those councils to remove it from their plans also," Cr Sutherland said. "He hasn't just singled us out, he's taken to us with a baseball bat because there has been a lot political argument in the Bribie Island area." He hasn't just singled us out, he's taken to us with a baseball bat because there has been a lot political argument in the Bribie Island area. Cr Sutherland said he told Mr Seeney the State Government had to direct the council to remove the sea level reference because if the council had done so voluntarily it could be legally liable. "We will now remove it from our planning scheme because we've been requested to do so," he said. "That shifts the responsibility from the council to the State Government. "It will now be the State Government that will carry the liability into the future." 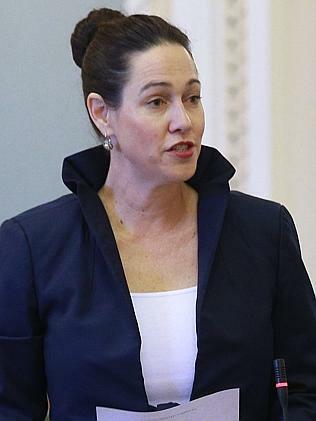 Labor's environment spokeswoman, Jackie Trad, said the edict was typical of the Newman Government. "Consistently this Government has denied that climate change is happening and they have changed the laws in this state to ensure that there are no planning or water allocation or environmental protection policies that account for the effects of climate change," she said. The Queensland Greens said science and the public interest had come off second best in the continuing fight between Mr Seeney and the observable reality of climate change. Mr Seeney said his intervention in the Moreton Bay planning scheme was not about accepting or denying climate change. He said the council's decision to include the 0.8-metre sea level rise had prompted complaints to council and the State Government, and angry public meetings. "Local (LNP) member Lisa France was invited to attend these meetings and, on behalf of her constituents, brought the issue to my attention," he said. Video 2:13 Deputy Premier defends forced removal of council's climate change references. Mr Seeney said it was about protecting property rights, not a climate change debate. "It's not an issue for zealots to engage in the sort of emotive language that doesn't produce any sort of a reasonable outcome," he said. "It's not a question of whether you're a believer or a denier, it's a question of responding appropriately to a risk that can't be quantified in any firm way, but we need to respond to the risk." Mr Seeney said the reference to climate change would would impact of property owners' rights to develop. "There's a big difference between planning for the future, planning future urban areas where you can take into account a whole range of different things, and using a planning scheme to retrospectively take away people's development rights," he said. "And that's what the proposed planning scheme for Moreton Bay Regional Council did. That's why I stepped in." Redcliffe community groups said they were not consulted when the council included sea level projections in its planning scheme. Ken Park from Moreton Bay Communities Alliance said the regional plan was drafted with no input from local property owners. There was a lot of alarm and despondency because property values immediately fell. "There was a lot of alarm and despondency because property values immediately fell, contracts [that had] been signed were cancelled, insurance premiums went through the roof and people perceived that their rights to develop their property further had been lost," he said. "But their main objection was of course that they were never consulted about it." Other councils - including Brisbane, Sunshine Coast, Whitsundays and Townsville - had incorporated the same assumption of a 0.8-metre sea level rise by 2100 in their urban or regional plans. The Local Government Association said it was seeking legal advice about the ramifications for all councils. It's a question of responding appropriately to a risk that can't be quantified in any firm way. Spokesman Greg Hallam said he had also written to Mr Seeney. "Some councils already have a 0.8-metre [rise] in their approved town plan, others are giving consideration to it," he said. "So we just want to understand what the approach will be for all councils so that we can take the appropriate action. "Our concerns have always been about councils' legal positions." Queensland councils are seeking urgent advice from the deputy premier after he forced one local government to remove references to predicted sea level rises from its draft regional plan. In a November letter to the Moreton Bay council, quoted by the ABC, Jeff Seeney wrote: "I direct council to amend its draft planning scheme to remove any assumption about a theoretical projected sea level rise from all and any provision of the scheme." The Local Government Association of Queensland is seeking urgent clarification from Mr Seeney. The LGAQ fears councils could be liable for damage if they are forced to remove references to climate change-derived sea level rises from their planning documents, and developments go ahead in vulnerable areas. It has written to Mr Seeney, seeking clarification about the legally binding directive to the Moreton Bay authority and what implications it might have for other councils. "Our concern has always been about councils' legal position," LGAQ spokesman Greg Hallam said. In drafting its regional plan, the Moreton Bay council assumed a 0.8-metre rise in sea level by 2100, and it's understood that assumption has also been reflected in other councils' planning documents. Mr Seeney told the ABC he had intervened "to ensure residents' rights to build and develop their properties were ... not restricted by their local council". He said there had been complaints to the government and angry public meetings after the Moreton Bay council decided to include the 0.8-metre sea level rise in their planning scheme. "I am prepared to protect the property rights of Queenslanders in other council areas should this issue arise again," he said. 1/ THE ONLY REASON WE HAVE TO HAVE A NEW TOWN PLAN IS BECAUSE OF AMALGAMATION. 2/ BOTH THE LNP GOVT. & THE CONCIL WERE ASLEEP WHEN PREPARING THE DRAFT FOR THE TOWN. 3/ THE ONLY GAVE THE PUBLIC TWO WEEKS TO EXAMINE THE DRAFT OF 4200 PAGES, NO PUBLIC OFFICIAL COULD HAVE READ & UNDERSTOOD THE DRAFT IN TWO WEEKS. 4/ INSURANCE HAS GONE UP THREE FOLD IN FLOOD AREAS, THANKS THE DRAFT BEEN PUT ON PUBLIC DISPLAY. 5/ THE SO-CALLED FLOOD WILL NOT OCCUR UNTIL 2100 ( 86 YEARS). 6/THEN WHY ARE WE PAYING FOR SOMETHING THAT MAY HAPPEN IN 86 YEARS. 7/ WHO IS RESPONSIBLE FOR THE INSURANCE INCREASES...THE STATE GOVT....THE MORETON BAY COUNCIL ...& THE INSURANCE COMPANIES.ALL THREE ARE! RE- Increased Household Premiums Relating from The Moreton Bay Regional Councils Proposed New Draft Plan . Currently under review . Please find following a copy of your “Objectives “, followed by a reply from the State Valuation Service of the Queensland Government to questions we have asked . These questions relate to the proposed changes to the Draft Plan currently being undertaken by the Moreton Bay Regional Council . This Draft Plan and mapping has been released for public consultation , and has caused such a stir of emotion in the community that it has been withdrawn for further work to be done , before being re released to the community , again for consultation . Your following” objectives “ should give members of the community with various forms of household insurance a feeling of security . Unfortunately , this is not so , with a large percentage of the community seeing their “Household premiums “ rising dramatically because of this proposed draft plan. This is the same “Draft Plan “ that is still under review, and as stated by the State Valuation Service that once the Plan is Gazetted , and they receive a copy they will then “ review the levels of value of properties in Moreton Bay “. As this Plan is still under review , and it is stated that there are no changes yet to the valuations , how can various insurance companies increase their premiums by so much. This has lead to some households , at present , not renewing their household insurance policies ! Can you please advise us what guidelines the “Insurance Council Of Australia “ recommends any policy holders, or ex policy holders to follow ? What advice would the “Insurance Council of Australia ‘ give its members ? Welcome to another MBCA Alliance Alert. On the 18th November, the Alliance’s Chairman, Ken Park addressed the Council at Strathpine chambers. A copy is attached for ease of reference. Once again the Mayor was not present and Ken made the message very clear and very loud with regard to the Communities’ expectations. We would like to take this opportunity to thank the supporters of Lake Kurwongbah Resident’s Group as well as those from Pine Rivers Residents Action Group who attended. Beachmere Area Network Group. In attendance was Peter Flannery, local Councillor for Division 2. We understood from Peter that Council were expecting to hear back from the State Government (QSG) regarding some legal issues concerning indemnities for the Council from the QSG within a matter of days. We further understood that whilst Council would have liked the second draft of the Planning Scheme to have been available for consultation before Christmas, it was more likely to be forthcoming in the new year. After the meeting ended, Steve Keeping spoke with Mr. David Percival, President of “Friends of Woorim”, (FOW), who advised that he had been following the Alliance Alerts with interest. Subsequent to that meeting, we are happy to advise that Friends of Woorim have joined the Alliance as its 22nd member. We welcome David and FOW and thank him for his assistance and enthusiasm. The Committee of the Moreton Bay Communities Alliance invited Mr Clive Burrows to its meeting on 23rd November 2014. Mr Burrows is Managing Director of Risk Management Group, highly respected consultants in risk management with offices in three states. Clive is also a long term resident of Newport Canal precinct, so he has both a personal and a professional interest in the draft Moreton Bay Regional Plan. Chairman of the Alliance, Ken Park said that the committee was keen to obtain Clive’s advice because, to the layman it appeared that the council had combined every conceivable doomsday prediction and every worst case scenario in an unrealistic way, thereby causing much consternation to many people. We were seeking some guidance about how we might evaluate the second draft when, hopefully, it will be more acceptable. Mr Park added that Mr Burrows is one of many professionals and experts living in the area who are only too willing to advise both the community and the council, if they engage the community in meaningful consultations. We really want to help the council to create a visionary regional plan that the people “own” rather than one that is imposed upon them, he said. The Alliance reinforced its concerns for all of our communities relating to the flood maps, figures taken into account for sea level rise plus storm surge and freeboard levels, coupled with environmental corridor removals, the total lack of consultation received from the MBRC, as well as the impact on a National scale that the problem could have. We also wanted to find out what policy might be applied to this plan if there was a change of government. We understood from the meeting that it was possible that some of the figures had been “Double dipped”, that is to say, applied twice over in the MBRC draft plan. We further understood that the ALP believed there needed to be adequate and proper consultation covering all aspects including development and zoning. We believe that the ALP considered that the MBRC had failed to mitigate the flooding and high risk claims. The Alliance also discussed its concerns about the removal of “ Injurious Affection” and asked that it not be used in any trade off in negotiations with Council, should the ALP be re-elected. We further understand that Tim Mulherin will write to the Mayor and Councilors outlining his views about the need for proper consultation and that he would e-mail a copy of that letter to us. The committee members of the Alliance left copies of the Community expectations with our hosts together with the recent letter from Diane Oxenford of BIEPA, (Attached in the last Alert), regarding the removal without consultation of the environmental corridors. Please see the attachment for the community expectations. We will of course continue to keep you all informed of progress as it happens. Here is a statement from the Insurance Council of Australia (ICA) in response to your query. This can be attributed to an ICA spokesperson. Please note that I am not a spokesperson for the ICA. Insurers offer cover for buildings and other assets on a property based on the level of cover required by the policyholder. The premium reflects the cost of repairing or rebuilding the asset. This is not based on the land value or the property’s market (real estate) value. The Insurance Council of Australia (ICA) has no access to Moreton Bay Council’s draft plan, nor would it be of particular use for underwriting purposes. The ICA’s National Flood Information Database (NFID) currently refers to flood studies from 2011 to calculate exposure to flooding for addresses in Caboolture. Members can refer to this information and rely on many other factors to calculate premiums: each insurer has its own method of calculating premiums based on a range of factors, including local government hazard data, historical data, claims frequency, risk and weather forecasts. Today, our Chairman will address the Council at their chambers in Strathpine. Committee member Rod Ridley also will be speaking and Tom Ross from Beachmere will be in attendance. The focus of the address will again be the further request of council to listen to the communities. We will advise the result in the next alert. Our secretary’s approaches to the Mayor requesting an audience with him and the head of town planning, unfortunately met with refusal, so our chairman Ken Park wrote to the Mayor again. Unfortunately, we have once again been referred to a member of the Mayor’s administrative staff. On November 11th, the MBCA has again written to the MBRC and the State Government outlining the urgent need to address the problems that the flood mapping has caused and is still causing amongst the community. Ken Park sent a follow up request to Adam Yem, Policy Advisor on Planning to the Deputy Premier and Minister for State Development, Infrastructure and Planning, in relation to the meeting we had with Adam and Lisa France. Ken asked for the latest information regarding the Deputy Premier’s directive to the MBRC re the 0.8m sea level rise. Our chairman also covered the other areas that were covered in the original meeting including, legislating of acceptable sea level rises, the indemnification requirements by the MBRC to the State Government. We reiterated our requests for open and inclusive consultation in the second draft plan. The letter also advised Adam that we are seeking answers from the opposition so that hopefully, there will be a bi-partisan approach to the communities’ concerns. On Tuesday the 25th of November, we will meet with members of the Australian Labor Party at Parliament House in Brisbane. As we mentioned in the last alert, our neutral focus is vital in order to fully understand the position of the ALP with regard to their stance regarding all concepts of the draft planning scheme. Our Department understands that the new Moreton Bay Regional Council draft-planning scheme is still under review. The Council can’t yet advise in regards to a proposed date for its submission for gazettal. Once the new Zoning Plan is gazetted, and we receive a copy, it is our intention to review the levels of value of properties in Moreton Bay. From this, if there are any changes, the changed values will be effective from the date of gazettal of the plan. RE – Land Valuations and Council Rates . Following the release of the “Draft Plan” by the Moreton Bay Regional Council, and the subsequent increase of premiums on the back of this proposed “Flood Plan “, it follows that there is a perceived increase in risk, and therefore the land is of less value . Certainly , in some cases where insurance companies have refused to provide any cover at all, the land is almost worthless. In addition the associated impact concerning restriction of future development of existing property provides an even greater downward pressure on the value of the land . We would like to know how you plan to reflect this downward shift in land values and how exactly will you apply the proposed “Flood Plan “ in the “Annual Valuation Notices. What action has the Valuer General taken to reflect the significant drop in land values as a result of the release of the M B R C Draft Plan , irrespective of whether or not the plan is implemented ? How will the Valuer General apply this proposed Draft Flood Plan to recalculate land values ?? The MBCA committee member Rod Ridley addressed the MBRC at 10.30am on Wednesday 5th November at the Redcliffe chambers. Rod spoke about the subject of “ Community Engagement”. We have pasted below, a copy of our Chairman’s comment regarding the treatment afforded Rod by council and the acting Mayor. on the need for community engagement. He spoke in the context of the Council’s draft Regional Plan. Mr Ridley, a member of the Moreton Bay Communities Alliance referred to many documents, some legally binding, some council’s own policies, which call for comprehensive, genuine and meaningful community consultation on the plan. The Council, he said had completely failed to consult at any stage of preparing the plan and now refuse to discuss with the ratepayers the programme for the required consultation when the plan is amended. Park. The Alliance now represents 20 separate local community groups from Dohles Rock to Donnybrook, with more groups joining all the time. Mr Park said that in his years of local government experience he had never before seen ratepayers treated with such discourtesy and disrespect. They just don’t want to listen, to consult or to hear about ratepayers interests. This plan is doomed to fail until the council listens and listens seriously. I talk to a lot of people and this issue is regularly raised. As you rightly pointed out, this is a State and Council issue. Planning matters are a responsibility of State and Local Government. If you could reference exactly what treaty or treaties you are referring to I am happy to talk with the relevant Government representative. It is important you continue discussions with State and Local representatives as that is where your focus is best put to use on this important issue. This is a very busy time of year and my diary is fully booked but as you know I have listening posts on November 18-20 and am more than happy to have a chat. I look forward to seeing you then Ken. The Alliance will continue to keep all parties aware of developments across the region regarding the effects of the Draft Plan and mapping. We will send them all a copy of the Alerts. As per our last Alliance Alert, we continue to be unable to get a hearing with the Mayor and Head of Town Planning. Recently, the secretary of the MBCA, sent another letter to the Mayor and councillors imploring them to withdraw the mapping, until such time as the legal issues between the State Government and council have been addressed and resolved. A copy of that letter is attached for your information. Mr Rick Williams, ALP candidate for Pumicestone. The request was for a meeting to brief the opposition and to try and determine their views on this most important issue, and to understand their interpretation of the ALP Policy Platform 2014; particularly paras 7.159 and 7.160. Of special interest also is their opinion on the South East Queensland Regional Plan 2009-2031.